In Poland, there are many places visited ghosts, black dogs, devils and witches. Taking a innocent stroll, one might vanish without a trace in the forest or be unfortunate enough to step into a cursed flat that brings bad luck upon its inhabitants. Culture.pl invites you into Poland’s haunted houses. Do you dare? Built in the 13th century, Czocha Castle owes its current design to Ernest Gütschow. This German entrepreneur bought the building in 1909 and rebuilt according to 18th-century illustrations. Maybe its the old-fashioned stone walls, the moat and lofty towers that make the castle such a hot spot for ghosts? Despite its picturesque location in Sucha near the Leśniańskie Lake in the Sudetes, the castle is often called ‘a ghost fortress’. And not without a reason! Each square metre of its premises is inhabited by spirits. Visitors have a ghost of chance to meet its first inhabitants on the bridge that leads into the castle gates. These are the spirits of mourners who attended a funeral procession in 1719. The bridge collapsed underneath them and the unfortunate wretches drowned in the moat. Their moans, in turn, are drowned out by the cries coming from the well in the courtyard. It is the cry of the unfaithful wife of Joachim von Nistitz, one of the castle’s owners. As a punishment for her dastardly deeds, the husband ordered his wife be drowned in the well. Her child, a fruit of her love affair, was bricked up in the castle’s chimney. Even today, the cries of the baby can be heard in the castle walls. The castle’s owners generally seemed to be very unlucky with women. Gütschow used to throw his unfaithful wives (apparently he had several spouses) straight into the castle’s dungeons through a secret trapdoor hidden in his bedroom. Even today, their poor souls remain imprisoned in the maze of underground corridors. But that is not all. Another ghostly encounter awaits: the oldest ghostly resident – the White Lady. She is the apparition of Gertrude who used to live in this castle with her brother in the 15th century. To take vengeance on her sibling after a heated argument, she set the Hussites against him. All in all, they did not conquer the castle, Gertrude the Traitor, in turn, was beheaded and cursed by her sibling. This is why she cannot even enter the gates of hell – she is doomed to roam the castle for eternity. Located next to the winding Liw River, the castle used to be inhabited by castellan Marcin Kuczyński and his beautiful wife Ludwika. As a token of his affection, Kuczyński gave his wife a richly ornamented ring. Unfortunately, it was lost. He then ordered another one but yet again the gift was lost. The story goes that the castellan heard his court gossip about his wife cheating on him and giving the the rings to her lover. Filled with anger, Kuczyński ordered the beheading of Ludwika. Soon after these events took place, in the spring, the two rings were found doing gardening on the estate – they were hidden in the nest of a magpie that had fallen. The crestfallen castellan committed suicide, but his innocent wife still roams around the rooms of her old house. She is called the Yellow Lady because she always shows herself in her favourite – yellow – dress. The impressive Ogrodzieniec Castle is inhabited by an atypical ghost: a big, black dog. Rattling a chain that weighs its neck down, the dog walks the castle grounds. Legend has it that it is the disembodied spirit of Stanisław Warszycki, the early 17th-century owner and administrator of the castle. Thanks to his skillful management, hemade a fortune which was later guarded with an utmost care. Warszycki did not want to share his wealth with anyone, even with his own children. Unfortunately, this extreme, unhealthy parsimony was not the magnate’s worst feature – he was also exceptionally cruel in regard to his subjects, servants and family. Even today, visitors can visit the torture chamber in which Warszycki deliberately and willingly inflicted pain on his poor subjects. Even the devil himself could not stand for these hideous deeds. Although he took the magnate straight to hell, Warszycki – as a black dog – still comes back to Ogrodzieniec to guard his wealth under the cover of night. Although Teofila (née) Działyńska gave up the ghost in 1790, she still lives in her castle in Kórnik near Poznań. The legend says that she leaves the frames of her gallery portrait to take nightly walks through its corridors. Nowadays, she would be called a businesswoman. Teofila was an extremely skillful manager of her fortune and premises. She rebuilt the castle making it an important cultural centre of the region – the castle library’s collection still holds plenty of invaluable books. Teofila was a true patroness of the surrounding grounds – her funds enabled the renovation of roads and bridges, the development of local manufactures and the construction of a Lutheran church. After she was widowed, she remarried. However, after she divorced her second husband, she decided to focus entirely on her work instead of looking for happiness in love. So why can’t such a noble soul rest in peace? It is said that Teofila ordered a small hunter’s lodge be taken down to make more space for the extension of her castle. The Górek family, the former owners of the lodge, left their family treasure protected by devils somewhere in the house. These evil spirits are still forcing Teofila to wander around her place as a punishment for disturbing them centuries ago. What happened to the treasure and – most importantly – was there any treasure at all? – We will never know. Located on the border between the Łódź and Opole voivodeships, the tiny Orthodox Church in Chrościn was built in the middle of the 19th century in the place of a former palace complex. Its churchyard was a place of eternal rest for locals and palace staff. Continuing the tradition, the first owners were buried under the church floors. However, the first funeral conducted there was of the owner’s son. The child was only a couple years old when he drowned in the nearby swamps, and it is said that he hasn’t left the vicinity of the church since. When the church was abandoned, it was frequently robbed. According to an official decision, the mortal remains were to be moved to a different place. So the child is constantly looking for his parents who were exhumed and transported to another cemetery. In 1908, the ‘Zofiówka’ Society for Poor Jews with Nervous and Mental Illnesses opened a sanatorium and a hospital in Otwock. Due to its frequent expansions, in the 1930s it offered a space for almost 300 hospital and health resort patients. Its name was owed to the founder, Zofia Endelmanowa, who donated her jewelry to the cause. After the outbreak of World War II, the place was seized by the Nazi Germans. In 1941, patients from different psychiatric hospitals (e.g. from Kraków) were moved to Otwock, and a majority of them was murdered the next year. It was a part of so-called ‘T4’ – the Nazi programme aimed at the elimination of people with mental illnesses. Later in the war, Zofiówka turned into the centre of the Lebensborn action. Its goal was to select women and men who would be perfect to strengthen the ‘Nordic race of Übermenschen’. When the war was over, the former Zofiówka could finally function as a hospital again. Beginning in 1956, it became a sanatorium for tuberculosis patients, and in the 1980s, it was turned back into a psychiatric hospital. Since the hospital was closed in 1998, its building remains abandoned. Once the war was over, the hospital was the place of a tragic find – over a hundred dead bodies, victims of the T4 action, were left in its rooms. These innocent spirits allegedly walk around the abandoned building, crying, screaming and moaning. This story sounds like a screenplay for a popular horror film: a group of young people sets off on a trip to a mysterious, less frequented place. After some violent, paranormal and dramatic events they all (or almost all) die. Some claim that this strange story has really taken place in the forest in Witkowice, Lesser Poland. Allegedly, nine students went missing under peculiar circumstances after entering the haunted forest. Until today their fate remains unknown. However, what is known for sure, is that the forest has inspired many dark stories over the years. There are many possible answers to the question why the unfinished villa at 8 Kosocicka Street in Kraków is haunted. Some legends explain that the house was built by two brothers, who had an argument that provoked one of them to murder the other. A different story ventures that the house was built on the grounds of a former cemetery. The new owners were cursed because they did not respect the sacred place. Others claim that the place is haunted by the ghost of a tenant who committed suicide. No one knows which story is true. Even the ghosts of the uninhabited house can’t help us answer this question because the infamous building was demolished in 2016. Interestingly, a huge group of paranormal phenomena enthusiasts protested the demolition. So, have these ghostly residents moved somewhere else? Nikt nie umie wytłumaczyć, dlaczego jeden z setek bloków na warszawskim Ursynowie przyciąga tyle nieszczęść. Pozornie nie wyróżnia się niczym, a jednak wiąże się z nim wiele tragicznych historii. Jedna z mieszkanek bloku wyskoczyła z balkonu, jej sąsiad zginął pod kołami samochodu, inny zamordował własną żonę. Życie odebrał sobie nawet listonosz dostarczający do bloku listy. Podobno wśród mieszkańców częściej niż zwykle trafiają się ciężkie choroby, wysoki jest też odsetek samobójstw. 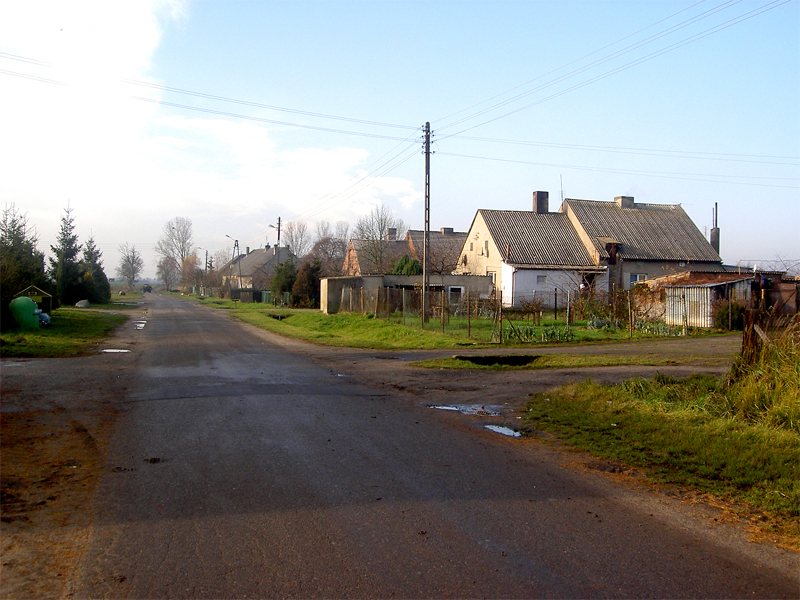 This village near Gniezno has once had a shorter name – just Małachowo. Today, it is called Małachowo-Złych Miejsc, or Małachowo of Bad Places. But why change the name of your town to Bad Places? Once upon a time, it was managed by a bad count – a liar and exploiter who did not respect his subjects. Legend has it that he was finally punished: his carriage fell into deep mud and the man drowned. However, this was not the end of the story: the ghost of the bad count came back to the village and today he haunts its drivers and causes many car accidents. So the new name is a warning for travelers to exercise caution when driving through the village. Taking into consideration the number of car accidents on Polish roads, may need such warnings would also be helpful elsewhere? Babia Góra literally means a ‘Mountain of Old Wives’. It is the highest massive of the Żywiec Beskids (1725 metres above sea level) and it has several peaks. The highest one, called Diablak (The Devil’s Peak), has a dark history. The story goes that the devil himself was building a house for a bandit who sacrificed his soul to evil. Unfortunately, the building collapsed, burying its future owner in the rubble. Even today the climbers can hear the noise of the bandit hitting the ground with his ciupaga (shepherd’s axe), trying to escape from the rubble. This Beskids’ peak was a favourite spot of many different creatures. It is said that Babia Góra hosted covens and meetings of devils. The mountain is still supposed to be haunted. The proof? Accidents that happen on its tracks (the more rational explanation is the weather, which changes extremely quickly in this region, but…).Many climbers and skiers have died on Diablak. Some smaller planes crashed into it. Researchers who are interested in supernatural phenomena are convinced that Babia Góra accumulates an exceptionally high level of unusual energy which disturbs the human mind and dulls the senses.